Warning: This is not The Fault In Our Stars! In many ways, it is the anti-tFioS. Dying people aren’t saints. But neither are the living. Alice is manipulative, dying, and harbouring an unpleasant secret. Her mission is to sort things out before she goes: to cross experiences off her list and do good deeds, sure, but mostly to settle old scores. Harvey is completely in thrall to Alice, with all that that entails. 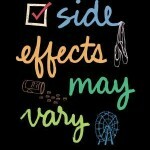 Alice knows this, and uses it. And things do not go according to plan. Not even the “dying” part. I strongly, strongly recommend this to people who like deeply flawed characters. People who can take a complicated, awkward, sometimes baffling journey with people whose issues and shortcomings run deep. 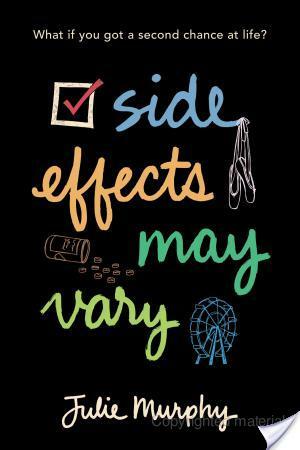 I’m not necessarily always the audience for those sorts of books, but Side Effects May Vary had me well and truly along for the ride. Julie Murphy is to be congratulated for that achievement.